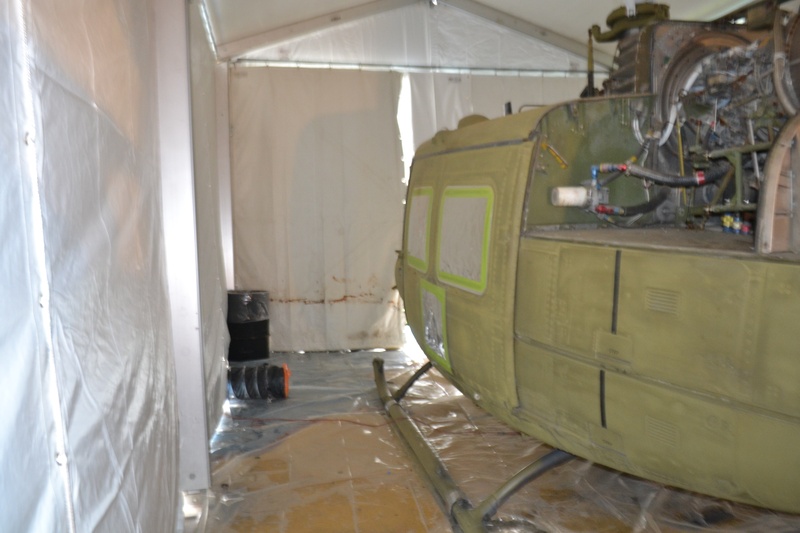 In October 2016, Mahaffey Fabric Structures got the chance of a lifetime to contribute to the restoration of a Vietnam helicopter, the Huey, thanks to a close partnership with Bombardier. To protect the historic Vietnam-era helicopter during the repairs, they designed a temporary hangar specifically to house the Huey. 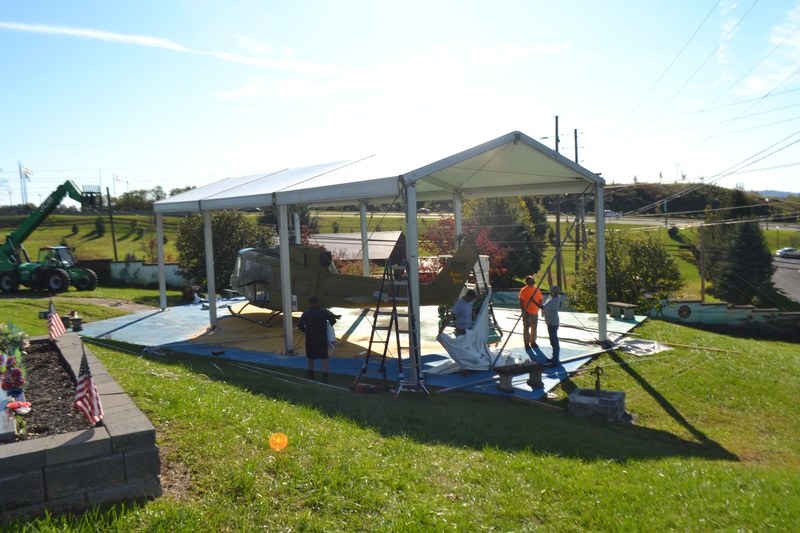 The Mahaffey team decided to show their support for the project by donating the tent and labor to install it — at no cost to Bombardier or Marion County Vietnam Memorial, Inc. With an experienced installation team, the helicopter was completely covered and ready for restoration in ONE day. 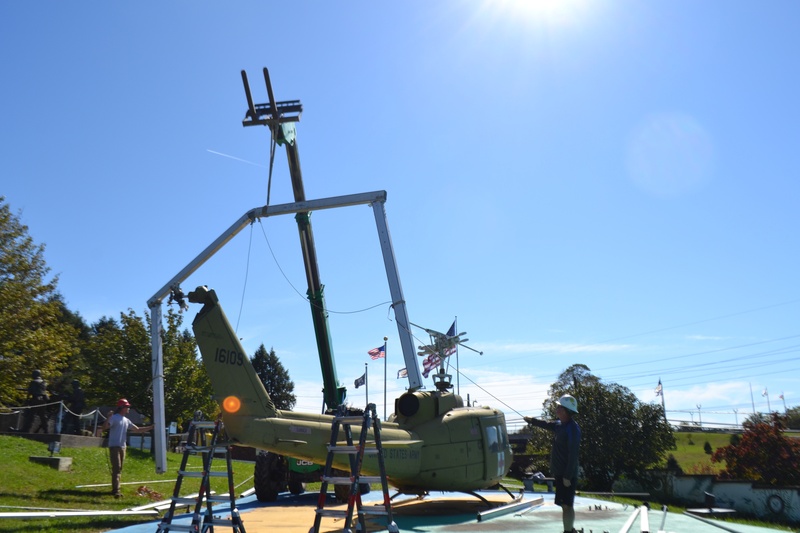 Thanks to the quick turnaround time, the entire restoration from setup to removal took less than a week, and visitors can enjoy the newly restored Huey as they pay respects to the men who served. Explore any city long enough, and you’ll find a memorial or monument dedicated to the members of the community who have given their lives in service to their country. In beautiful Fairmont, West Virginia — just as you pass the downtown exit, heading south on I-79 — stands a massive U.S. flag, the customary marker of memorials throughout all 50 states. The Marion County Vietnam Memorial is the brainchild of Alfred Knoll, who served in Vietnam from 1968-1969. 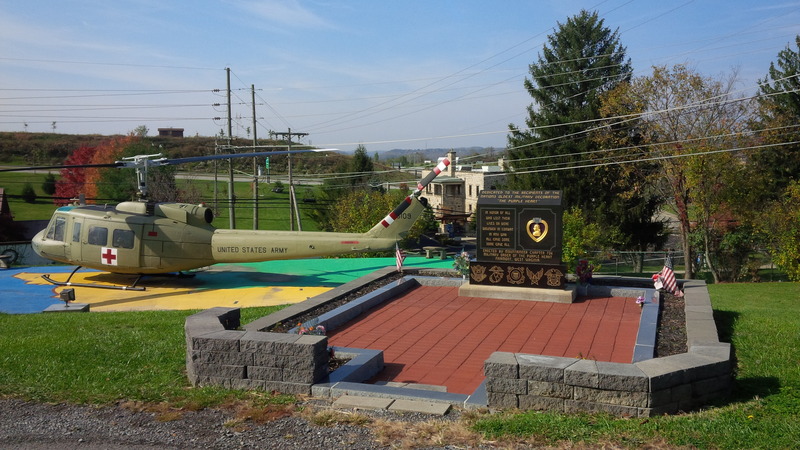 Located at the entrance to East Marion Veteran’s Memorial Park, the memorial consists of a six-ton monument with the 27 names of the men from Marion County who died in Vietnam, along with a Huey helicopter that flew in Vietnam. The gigantic “Old Glory” demarcating the memorial site is a fitting tribute to Alfred Knoll’s original vision, which was to acknowledge and recognize the service and sacrifice of all of those from Marion County who were killed in Vietnam. Knoll's effort began back in 1988, when he and a group of like-minded veterans formed the Marion County Vietnam Memorial, Inc. Less than 10 years later, in June 1995, construction began. In October of that year, the monument was installed. Now, Marion County residents and visitors alike travel to the memorial twice a year, on Memorial Day and Veteran’s Day, to honor those who have served. 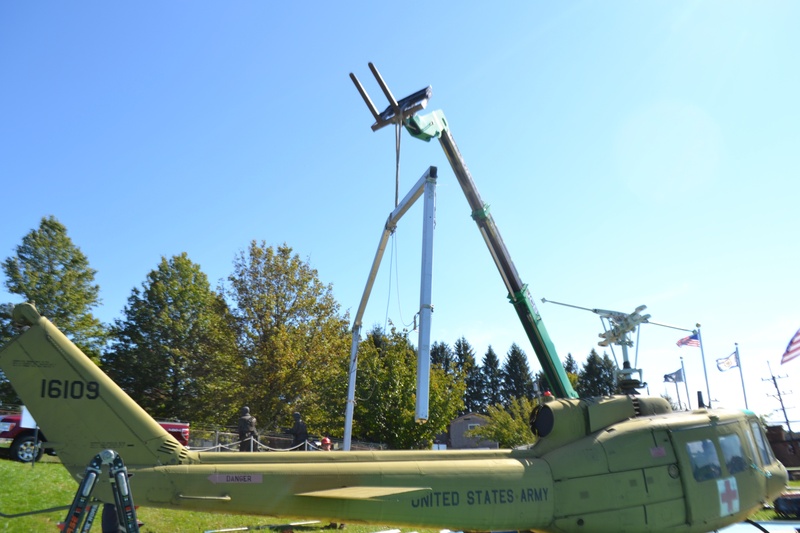 While the Marion County Vietnam Memorial monument resembles many found throughout the U.S., what sets this site apart is the fully restored Vietnam-era UH-1 “Huey” helicopter. Although not all memories of the Huey are happy ones, many Vietnam veterans have a genuine affection for it. These birds brought troops in and out of war, dispensed much needed supplies, and even delivered Thanksgiving Day dinner to soldiers in combat. Its familiar whup-whup evokes a sense of home for many veterans, as they were often transported wounded soldiers to safety and medical treatment. U.S. Army helicopter UH-1D tail number 66-16109 was purchased by the U.S. Army in March of 1967. It went to Vietnam in January of 1968, where it had logged 4,908 hours in the air. 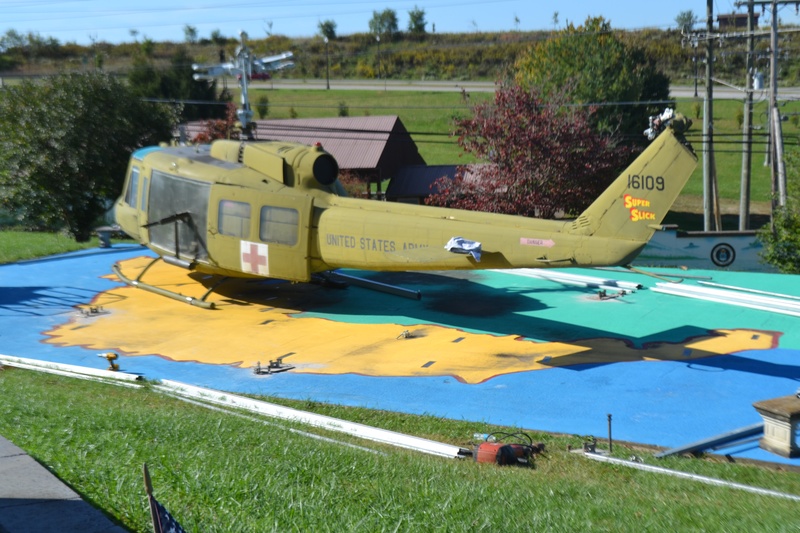 Following the donation of the Huey in August 1996, the Marion County Vietnam Veterans Memorial, Inc. agreed to assume and pay all costs, charges and expenses incident to the donation, including the cost of any required demilitarization and preparation for transportation to Fairmont. In August 1996, Ronnie Miller, owner-operator of Miller Trucking, left for Fort Rucker, Alabama to pick up the Huey. 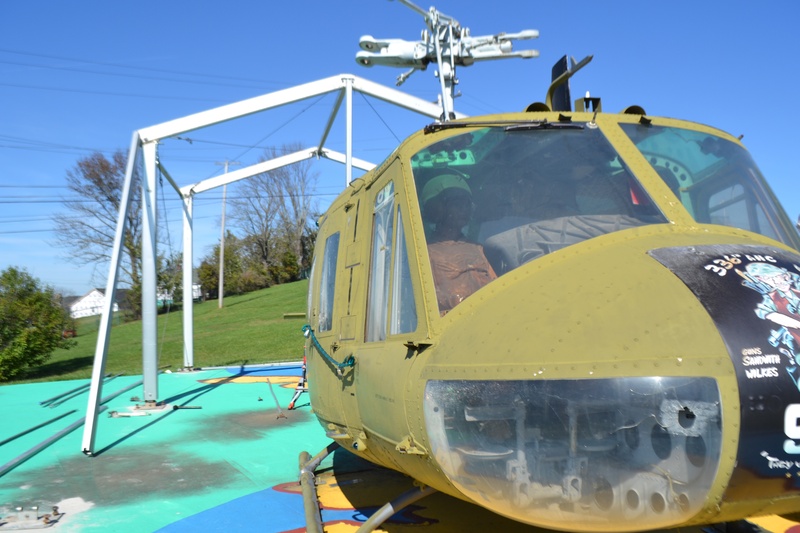 With the help of City Crane & Equipment, the Huey was unloaded and placed on site for restoration to begin. 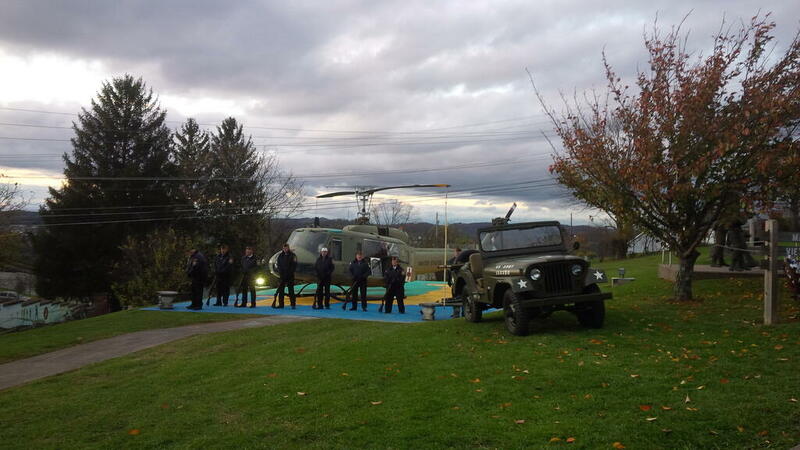 Following news coverage of the Huey’s arrival in Fairmont, Bob Conshafter, an aircraft mechanic and aviation history bluff at Bombardier, drove to the memorial to take a closer look. 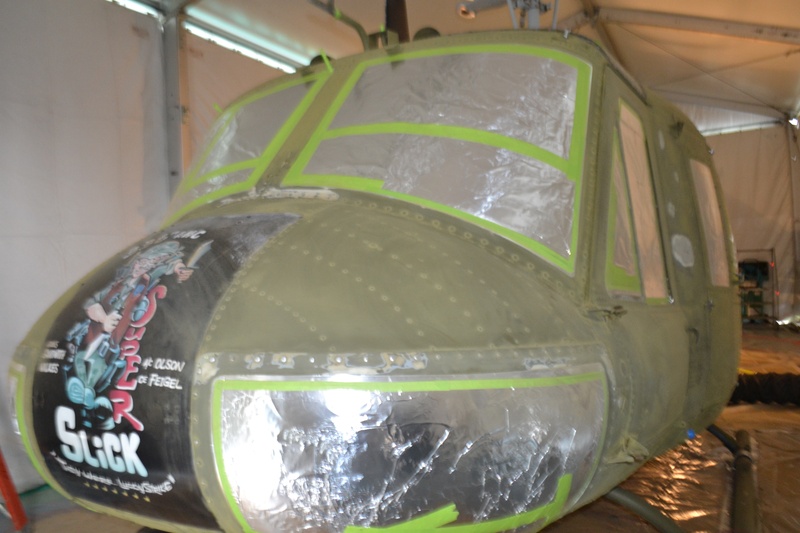 Veterans, their wives, and volunteers were already hard at work attempting to restore the Huey to its former glory. When he arrived, he saw them using sandpaper and wooden blocks to strip the paint, and knew they needed his help. Conshafter contacted his boss, Robert Lyle, Bombardier’s vice president and general manager. Lyle, who flew Hueys in Vietnam, agreed to take on the more difficult work, such as chemically stripping and repair the Huey. 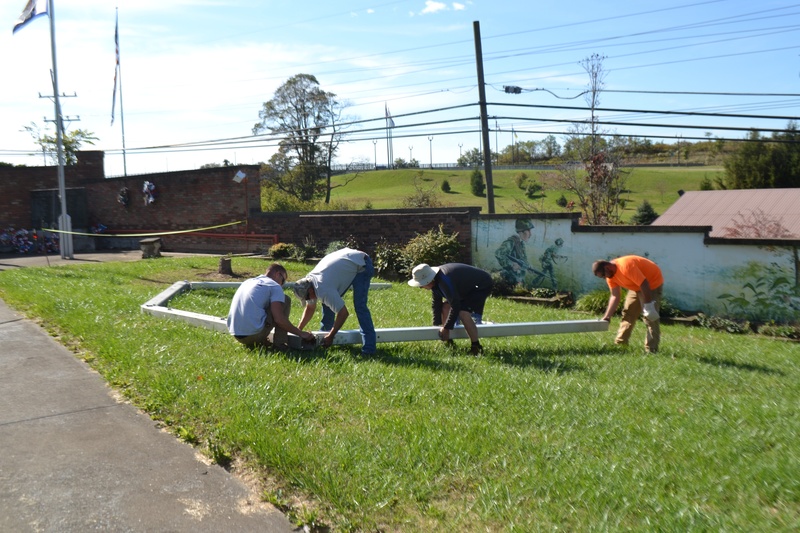 He brought the helicopter to the West Virginia Air Center in Bridgeport, West Virginia, and rallied his employees to volunteer their time and skills for the restoration. 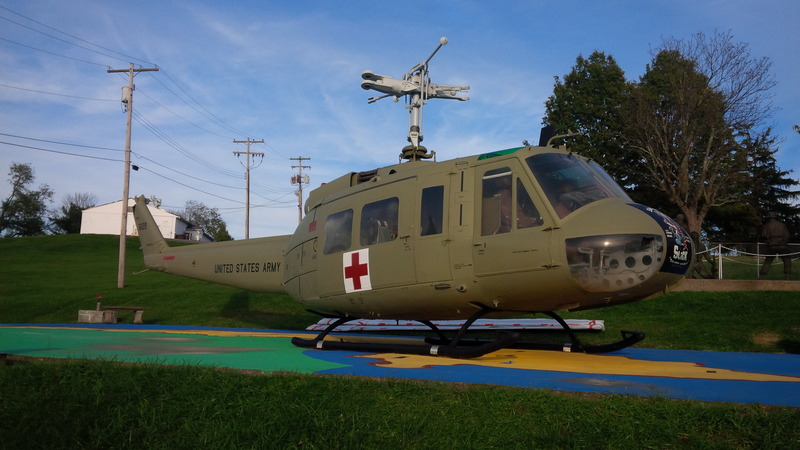 On January 15, 1998, at a cost of more than $12,000 and with the help of Vietnam Veteran Kenny Jo Vincent, owner of Vincent Trucking, the Huey was transported to its new home: Marion County Vietnam Veterans Memorial. In October 2016, Bombardier returned to Marion County to perform additional restoration and repairs. 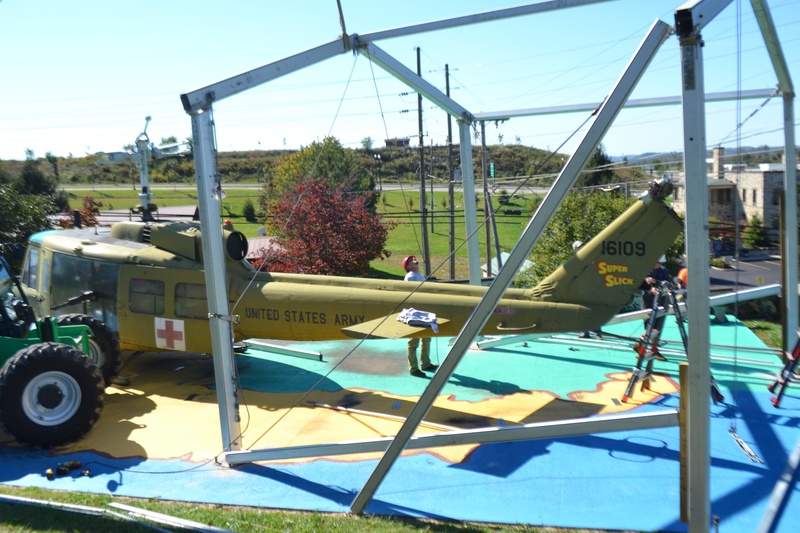 Rather than move the helicopter to its air center for repairs, the company wanted to perform the restoration on-site — reducing the time needed to complete the project and saving on transportation costs. Mahaffey regularly partners with Bombardier for aircraft maintenance and repair projects, making them the natural choice for such a quick project timeline. On October 12, Mahaffey deployed a 20’ x 50’ temporary hangar from its MegaStructure series. The modular design and quick installation time make these structures the perfect choice for covering aircraft in need of repair, especially in locations where hangar space is at a premium or non-existent. 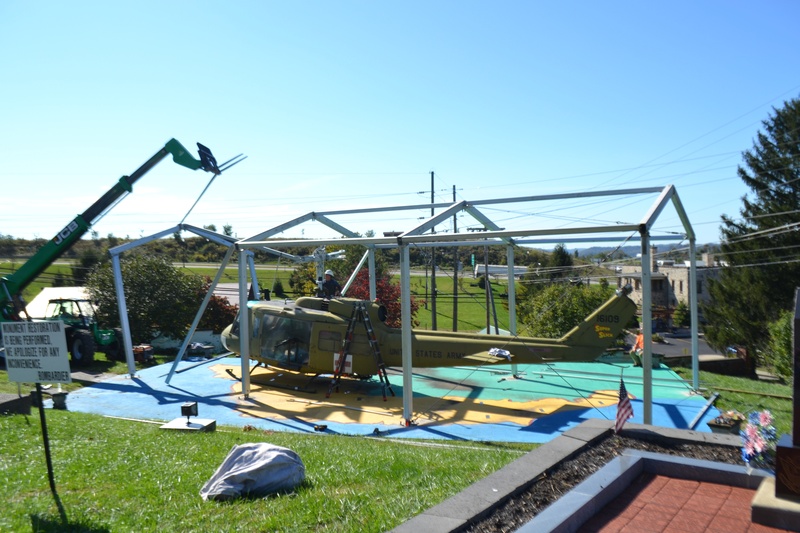 Less than a week later, following the completion of the project on October 17, Mahaffey removed the temporary hangar to reveal the Huey — restored to its former glory.